Sometimes I think that cakes look much more complicated than they actually are. This one is a good example, there are lots of details like the buttons, stitching, piping etc but actually if you have the right tools, these are all very easy to make. I began by making some of the decorations for both the cake and cupcakes. The buttons were made by pressing fondant into a silicone mould and left to dry. 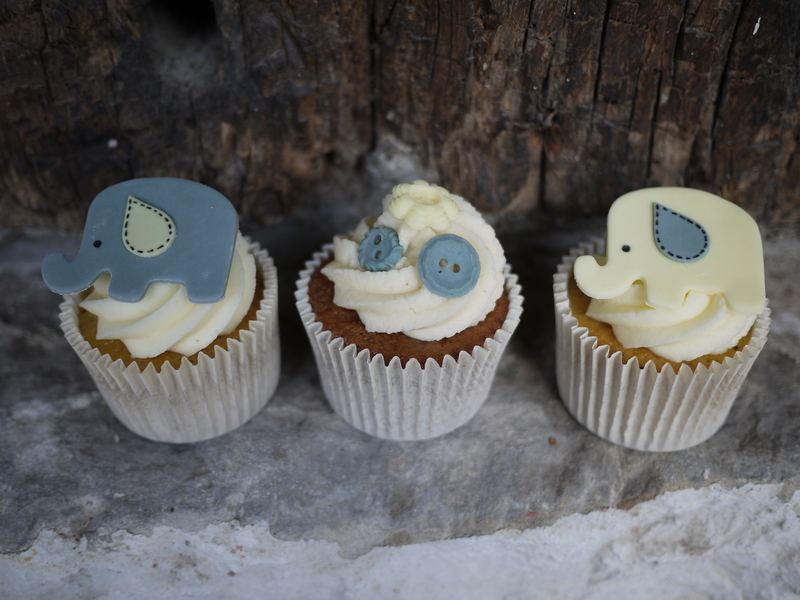 The elephants for the cupcakes were cut out from fondant with an elephant shaped cookie cutter and the ears were done in the opposite coloured fondant and cut out using a small petal cutter. The stitches were drawn on using a pen with edible ink. These were then left to dry too. The board and cake were then iced in white fondant. I then added a very thin layer of yellow fondant to the top of the cake and cut it to size. 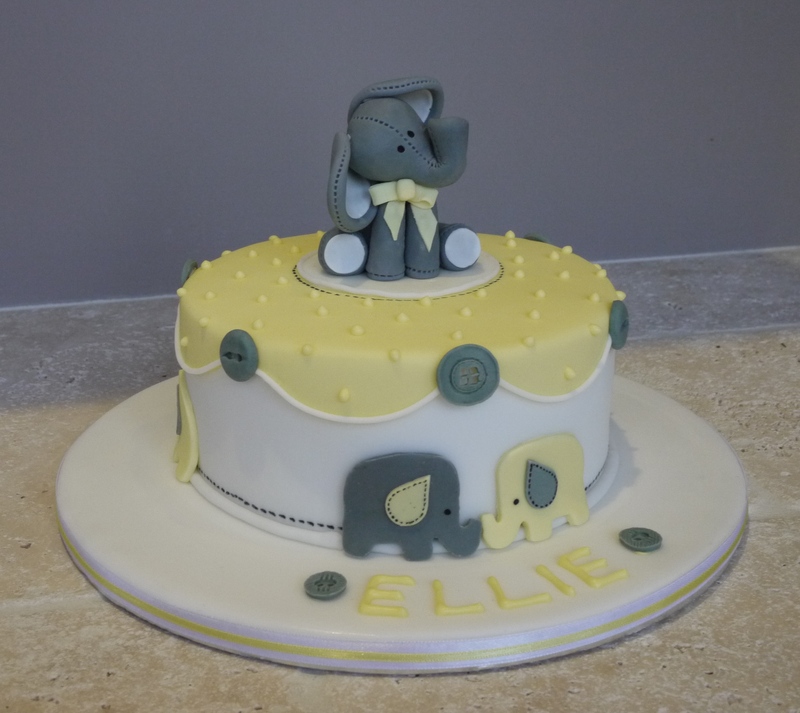 A small white circle of fondant was then place on the top in the middle of the cake for the elephant to go on. To keep the edges looking neat and to add extra detail, I added white ‘piping’. Actually this was not piped, but made from fondant softened with a small amount of vegetable fat and water, it was then squeezed through a special syringe that has different sized attachments to make the piping thicker or thinner. I used different sizes around the top of the small white circle, to edge the yellow covering on top of the cake and to hide the join between the cake and the board. Stitching details were added using a pen with edible ink. 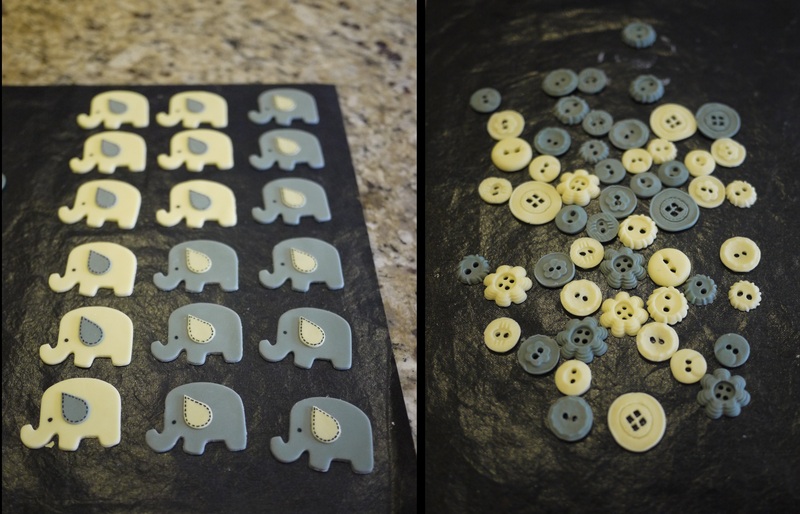 The buttons and flat elephants were added and secured in place by dampening them lightly with some water. The large elephant for the top was made with separate pieces for the legs, body, head and ears. Each piece was made and the stitching detail was added using a roller wheel that has fine teeth. The elephant was assembled and secured together by dampening lightly with water. I then made a small bow with yellow fondant and secured in place. 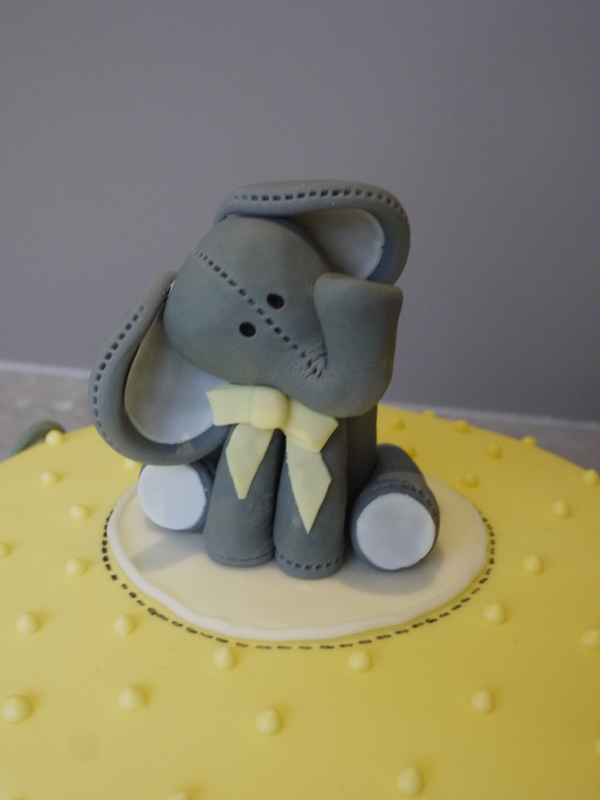 Once the elephant was dry, it was placed on the top of the cake. The cupcakes were lemon and poppy seed and hot chocolate, 2 very popular flavours! 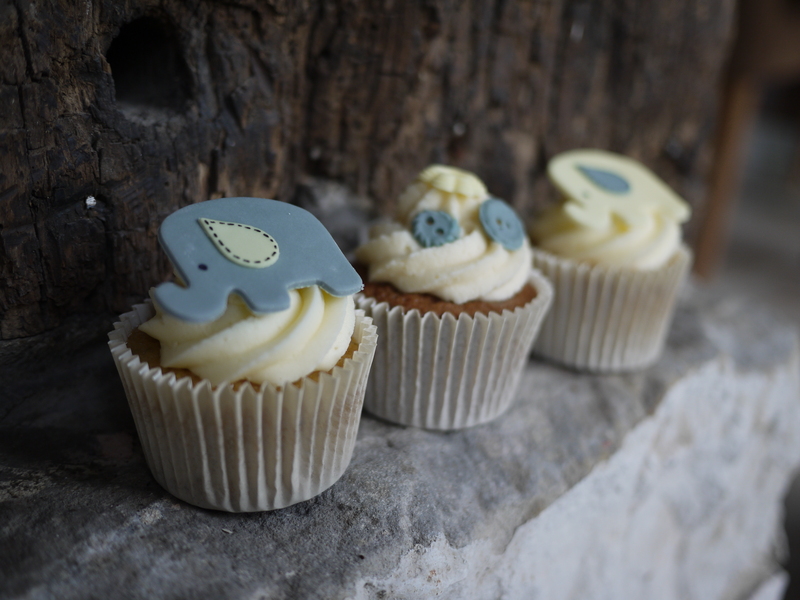 The Christening was lovely, as was the gathering afterwards where we had home made soups and Cornish pasties followed by plenty of cake! Wow. This cake is absolutely amazing! The little elephant is so cute!